DIVE! actually came out in 2010, but as part of my quest to watch as many food and environment documentaries as I can, I added it to my queue. The film focuses on waste – in particular what America throws out. The dive to which the title refers? Straight into a dumpster. In just the first few seconds of the film, we’re reminded that America wastes 3,000 pounds of food per second. So in the time it has taken you to read this far, we’ve wasted several thousand pounds of food. It’s true that 40% of the food that’s wasted is thrown out in our households. But what about the other 60%? 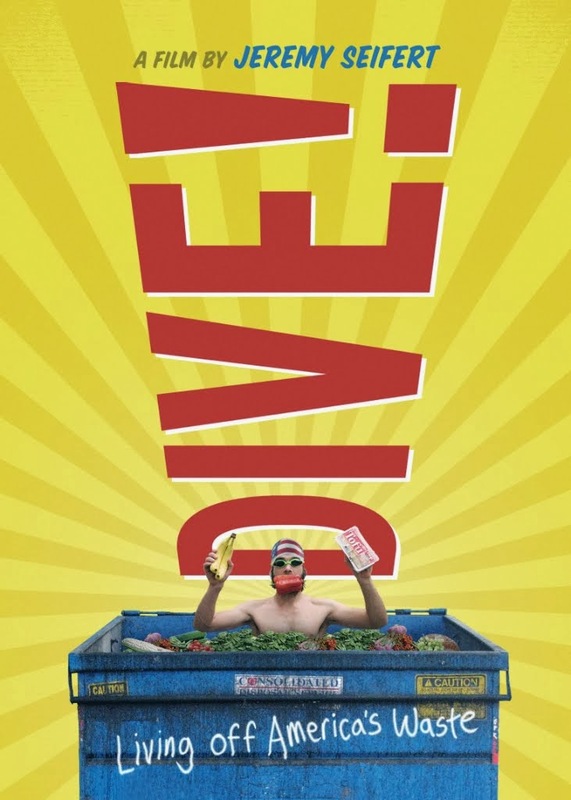 The film follows people who actually dumpster dive for discarded food from grocery stores. I was shocked to see how much food they would find on a nightly basis that was perfectly edible. Entire bags of avocados or packages of tomatoes, where one had gone soft or moldy, but the rest were fine. Slightly wrinkled blueberries or bags of salad greens that were one day away from “expiring.” Even more shocking was the amount of meat wasted. In the span of seven evenings, the people in the film found enough meat to feed a family for a year. Being outside in the cold night? It stayed refrigerated and sealed. And in the garbage. The people who do this see it as civil disobedience – actively opposing the immorality of perfectly good food thrown out by corporations when millions of Americans go to bed hungry each night. I see it that way too. Because of the Good Samaritan Act passed during Clinton’s presidency, companies are protected from liability for food donations. But many still throw out food in advance of expiration dates. And refuse to donate it, even when asked. Regardless of the morality factor, it’s not even good business practice. We waste 50% of the food produced in this country, to the detriment of our environment, economy and our societal well being. One person in the film is quoted as saying “when you waste food, you waste life.” Every time you throw food out, you’re not just wasting that food, but all of the resources that went into producing it – water, time, labor, etc. This film reminds us that we’ve forgotten that food is precious. It’s a valuable gift. We take it for granted and consume it divorced from its true cost. Say you throw out leftovers. What if you also dumped 1,000 gallons of water down the drain at the same time, and then put $5 on your kitchen counter and set it on fire? Would you be more likely to eat, share or preserve that food if you were aware of what you were truly wasting? While this film felt like a “first documentary” from the filmmaker, with a lot of footage that seemed like it was recorded on someone’s iPhone and a lot of “I tried to get someone from X store to speak with me and they refused,” it still kept my attention. It also made me interested in reclamation programs that work with companies to salvage discarded food before it’s lost to rot or spoilage and help get it where it needs to go to feed people. Even though I probably won’t be dumpster diving anytime soon, I will probably ask my grocery store what they do with the food they throw out when I visit this week. After thoroughly purging and organizing the belongings in just one room of our house this weekend, I got to thinking about waste – specifically how much space has been wasted in our house and also what opportunities are wasted when we store belongings away that could be useful for someone else, if not for us. Recently, my coworker told me about hearing a news report about the amount of food that is wasted because of expiration dates and labels. Her church organizes a food pantry and is not able to serve or give away food that is “past dated” – even if it’s perfectly safe, edible and even delicious. On one hand, I understand why this guidance is in place for groups that are serving large amounts of people – you don’t want to gamble with people’s safety when you are responsible for others, particularly vulnerable populations. But unfortunately, the dates and labels themselves are misleading. According to the study that has been reported recently, 90% of Americans say they have prematurely thrown out food because they misinterpreted the labels and dates on the package. These labels are generally suggestions from the manufacturers about peak freshness, not suitability for consumption. According to the same article, “in 2012, an NRDC study found as much as 40 percent of the country’s food supply goes uneaten. The cost of that wasted food? Roughly $165 billion, including $900 million in “expired” food. A family of four, the study found, spends an average of $455 a year on food it doesn’t eat.” (emphasis mine) We should look at those numbers and find them unpalatable (no pun intended). That’s a staggering amount of food waste, especially when industrial agriculture is trying to tell us that they need to produce more to feed the world. We already produce more food than this country needs (not to mention that this country eats more calories a day than it needs to). The reason we have hunger issues in this country is not production – it’s distribution and access. So what can you do? Here are five strategies we use in our house. Each week, we plan out what we’re going to make for dinner and estimate the leftovers to determine lunches. This allows us to have a very good idea of what we can eat in a week’s time and to know exactly what we will need on a given day. We check what we have in our pantry and refrigerator when we are choosing meals – and even have our freezer contents in a shared spreadsheet so we can keep track of what’s hiding at the bottom! Use your meal plan to determine what you need for the week and make a list. When you go to the store, don’t veer from the list. We make exceptions when pantry staples are on sale and we can stock up at a savings, but we only buy things we know we will use. If you go to the store without a plan, you’ll buy things that you feel like eating when you’re there, but you might not want to eat later on. You also run the risk of not buying the right quantities. 3. Buy from the bulk section when you can – and buy only what you need. We buy spices from the bulk section, as well as grains like oats and rice and dried fruits and nuts for granola. Usually the prices are lower in general than buying the items in a commercially packaged container, but it also helps you only buy what you can use at its peak of freshness. Spices lose their potency over time, so it’s better to buy 4 tablespoons of ginger at a time for a small container at home than enough ginger for a bakery from a warehouse store. 4. Smell and look at your food. 5. Consider labels to be guidelines and not rules. Go ahead and use the dates as a guideline – but they aren’t rules. You can just as easily get a container of yogurt from the store, open it before the “sell by” date and find mold as you can if the date has passed. Don’t throw away perfectly good food because someone 8 weeks ago estimated that it might not be quite so fresh after a certain point. You will see a difference in your budget when you do! October Simplified update: Listed about 50 books for sale that had the potential to help me recoup some cost and packed up the rest to donate and repurposed mismatched sheets as drop cloths for Mark’s wood working space. Up next, the guest bedroom!